A news investigation last week reaffirmed that nitrate levels in the Des Moines River watershed exceed the Environmental Protection Agency’s drinking water limit, posing a threat to infants, pregnant women and others for whom excessive nitrate can be a health hazard. Television station KCCI Des Moines, a CBS affiliate, tested water samples from Calhoun and Sac counties – two of the three counties being sued by the Des Moines Water Works over agricultural pollution of the city’s water supplies. 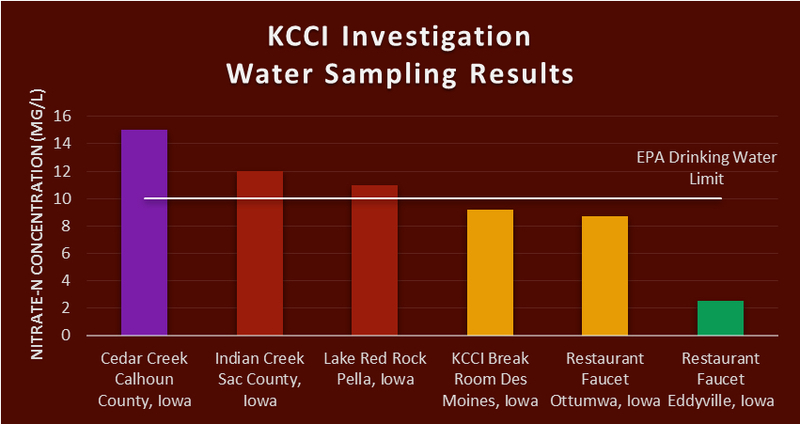 The station also tested samples from Lake Red Rock, a popular outdoor recreation destination in Iowa, and from restaurant faucets and KCCI’s break room. The testing found that rivers surrounded by agricultural land had nitrate levels well above the EPA’s permissible drinking water limit of 10 milligrams per liter. Real-time sensors monitoring Iowa waters had previously recorded similar results. Within city limits, however, nitrate contamination was just below the EPA limit. What this means is that the Des Moines Water Works is delivering safe drinking water to the city’s residents – but at a price. In effect, they are paying twice for clean water, once through the taxes that fund federal and state conservation programs and again when they pay their water bills. This especially galling because since 2005, Iowa has received billions in federal funding, primarily to support voluntary measures that growers can use to keep nitrates and other farm pollution from flowing off agricultural fields and into the rivers and streams that are the source of drinking water for Des Moines and other communities. The amount of taxpayer dollars spent to help growers implement voluntary conservation is a poor indicator of success, however, because farmers who voluntarily start conservation can – and do – just as easily stop. In fact, a recent EWG investigation in Iowa found that from 2011 to 2014 there was a net loss of vegetative buffers – an affordable conservation practice – between crop fields and waterways. Despite the evident ineffectiveness of the dollars that have been poured into voluntary water quality programs, Iowa is in line to receive another $3.5 million in July through state funding for these cost-share programs – even though only 3,000 of the state’s 87,000 farms have stepped up to the plate. Taxpayers deserve clean water and consistent conservation. Growers who pollute drinking water should be required to implement basic protective practices as part of their landownership. It’s time to take a stand against those who pollute drinking water.